That is crazy. Maybe now my parents will stop yelling at me to get a job and stuff. 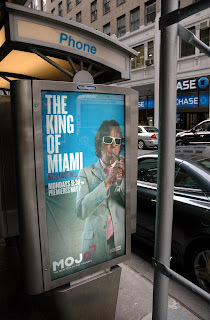 Oh yeah, you can also watch clips of “The King of Miami” at the futuristic website of Mojo (the futuristic network referenced earlier) located at here. Okay then, thank you for your time. Who is the best? You! Oh God that's brilliant. And what a relief there'll be clips on the internet for me. I was really worried about that, I didn't want to get left behind like a pair of trunks discarded on the beach. The show looks exciting and fun and although I fear you are too good for us now, I'll keep showing my face here until it's obvious I'm crashing an exclusive party. The show looks awesome. I'm going to run out and buy an HD TV just for the show. Well, this is if my wife lets me. Well I hope you've found a place to watch it cos I think it's going to be on any minute. Just looking at the MojoHD site has explained something to me. I was at a filming of "The Album Chart Show" in Koko, Camden, London, UK in December and the warm up/technician person warned us that the perennially unlikeable Joe Mace would be coming on stage and we should keep quiet when he says "Can you feel (or maybe it was see) my Mojo? ", then we had to go wild. I didn't understand the catchphrase and to make matters worse you couldn't hear him say anything as I suppose he wasn't miked up for the crowd. I bet you he'll turn to the camera pointing his fingers and then say that and he'll have this really bad attempt at Russell Brand's hair. You won't see me, I stood underneath the camera then wandered around the balcony. We had to pretend to see Amy Winehouse and Guillemots, but we really did see Badly Drawn Boy. He's ok but I pretty much hated the night, left before the Sugababes and headed two tube stops to a free comedy night in Islington, where I bantered with the excellent MC and got given a Christmas present. Thank God the arts are all represented down London village. Sorry for that sort of rant thing. Hope the show gets millions of viewers.